Make a professional impression with some Custom Jumbo Paper Clips and be pleasantly suprised on the increase in your profit margin. 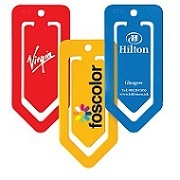 Customised with a 1 colour print on the front, you can use a promotional paper clip to attach an invoice, promotional slip, or even a voucher or a special offer just for the customer, and they will keep this unique business gift for another paper or documental use. Hand out to customers, send Custom Jumbo Paper Clips with a mail shot or even attach to the invoice as an added incentive to continue working together. For a FREE QUOTE, please fill in the form regarding our Custom Jumbo Paper Clips and we'll be able to help you.